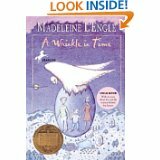 This is a study guide for A Wrinkle In Time by Madeleine L'Engle. The universe in A Wrinkle in Time is a battle between the forces of light and darkness, or good and evil. The evil is represented in this L'Engle work metaphysically by the Dark Thing or the Black Thing, and manifests in the physical forms of the man with red eyes and IT. The representatives of light are perpetually involved in a struggle against darkness. The good characters are various. There are Mrs. Whatsit, Mrs. Which and Mrs. Who, whose essential forms, as revealed on Uriel, seem to embody bliss and joy. Mrs. Whatsit was formerly a star that gave up its own life in the battle against darkness. The creatures on the planet Ixchel are also defenders of the light against the darkness. Needless to say, Mr. Murry and the children are also on the side of the light. Good is associated with love, individual creativity, moral responsibility and free will. Evil is associated with conformity, hatred, submission to authority, and lack of personal responsibility and initiative. Evil is presented as possessing many of the qualities historically present in communist societies, including excessive bureaucracy, a drab sameness, and mind control amounting to brainwashing by a central authority. In this sense the novel can be seen as an allegory of the cold war between the freedom-loving West and the communist Soviet Union. This becomes explicit when Meg realizes that the Declaration of Independence, with its statement that all men are created equal, is quite different from the false equality or sameness imposed from outside, which is what happens on Camazotz. Please click on the study guide literary analysis category you wish to be displayed. Back and Next buttons can guide you through all the sections or you can choose to jump from section to section using the links below or the links at the left.